More fights are coming to Fight Pass and FOX Sports 1 this weekend (Sat., Aug. 20, 2016) when UFC 202: “McGregor vs. Diaz 2” storms T-Mobile Arena in Las Vegas, Nevada. MMAmania.com’s Patrick Stumberg kicks off the UFC 202 “Prelims” party with the first installment of a two-part undercard preview series. Conor McGregor continues his merry Welterweight adventures this Saturday evening (Aug. 20, 2016), rematching Nate Diaz in the main event of UFC 202 in Las Vegas, Nevada. The T-Mobile Arena will also host a terrific Light Heavyweight clash between Anthony Johnson and Glover Teixeira, plus guaranteed Welterweight fireworks as Donald Cerrone faces Rick Story. 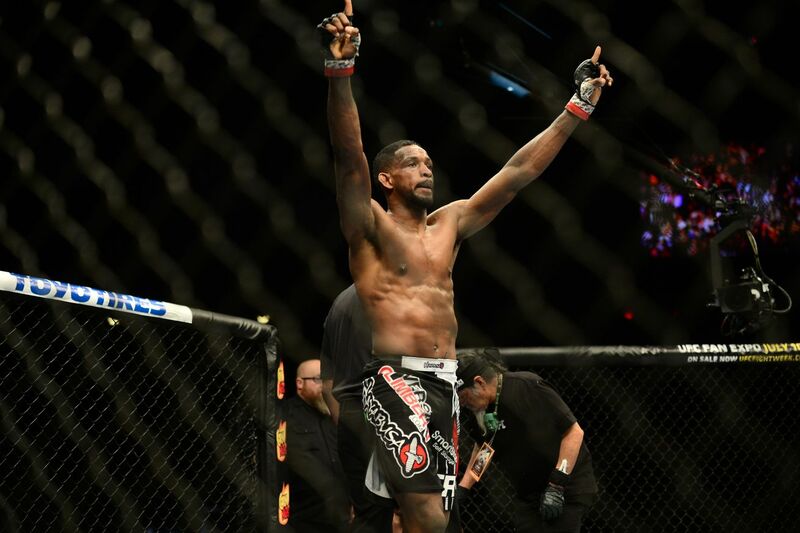 Despite just reaching the semifinals in one of the worst The Ultimate Fighter (TUF) seasons, Neil Magny (18-4) has emerged as one of the Welterweight division’s best. He’s won 10 of his last 11 fights, including a comeback knockout of Hector Lombard in his most recent bout. Larkin — who opened his Strikeforce career at Light Heavyweight — has found a real home for himself in UFC’s 170-pound division. He’s gone 3-1 since making the drop, the sole loss a close decision against Albert Tumenov and one of the victories a knockout of Santiago Ponzinibbio. He’s knocked out 10 opponents overall. This is a really, really good fight, far more intriguing than the planned match up between Magny and Dong Hyun Kim. I expect the same result, a Magny decision, but he’s going to have a much tougher time pulling it off.